LSU received an official visit last weekend from 2020 recruit Jonathan Aku, a 6-11 Center out of Andover, NH. LSU is hosting 2019 basketball prospect Avery Anderson III today on an unofficial visit. Anderson, The 6-2, 165-pound Anderson ranks as the No. 64 overall prospect in the country, No. 8 combo guard overall and No. 6 prospect in Texas, according to the industry-generated 247Sports Composite. Is Penny going to let a single kid leave Memphis? The guy is a deity in that city, even moreso to the basketball/inner city community. Its hard to understate how much influence he has there. Coach Wade and staff are on their grind looking at potential 2019 prospects. LSU reported to be linked to 6-7 SF Aundre Hyatt out of White Plains, NY along with Rutgers, Seton Hall and Florida State. Aundre` Hyatt is being recruited for 2019. Billy said he might reclassify. He also said a lot would have to happen for it to go down, so it’s a long shot. Is it a long shot for Lecque? Kentucky and Kansas are his current top schools of choice. It is true that he is a 2019 prospect; but it has been reported he could reclassify to 2018, and is actually leaning that direction depending on how quickly his knee heals. It was reported yesterday that he has set his 3 visits: Seton Hall (Jul 18-20), Pitt (Aug 1-3), and LSU (Aug 4-6). He has already visited Rutgers. Now, let's play a little conspiracy theorist here. Seton Hall, Pitt, and Rutgers all have room for Hyatt on their 2018 roster; LSU does not at the present. Therefore, the question has to be asked - is Wade being proactive in setting up a visit in hopes of convincing Hyatt to stay in '19 class and try to get him for then? Or, is there a possible attrition move on LSU '18 roster that no one sees coming, opening up a sport for Hyatt if he wants it? As it sits, LSU is full up on scholarships for this year. If any attrition were to occur, it would be through a discipline issue, as it would be a bad PR move for Wade to just yank a scholarship from someone at this point in the year. Rachal (who finished the year with an undisclosed issue that prevented him from playing in the NIT, and had a suspension earlier in season) and Sims (who also had a suspension and couple of issues last year) would be the two likely candidates. All of this is speculation of course, but a picture was tweeted out a few days ago by Rachel Baribeau of her with the team and coaches after doing a presentation, presumably to the entire team. Harmless? Sure. But there was one player missing from the pic - Rachal. It could be a coincidence and I am reading way too much into it. 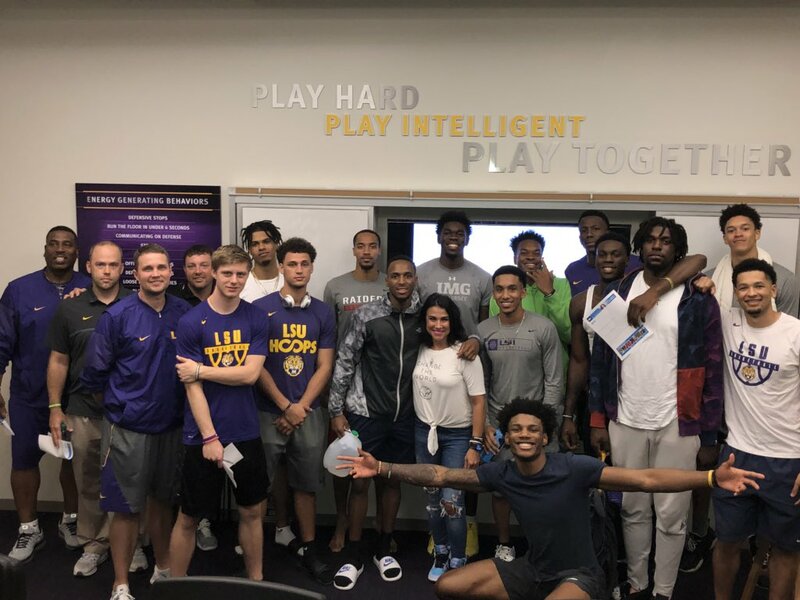 But the picture, coupled with the fact that I haven't really heard his name mentioned by Wade in any interviews this summer, and the fact that Hyatt is visiting prior to start of Fall semester, could point to LSU having let Rachal go and is telling Hyatt they have a position for him even if he decides to reclassify. Wade has already shown that he is very good at hiding information he is not ready to have released yet, especially when it comes to roster mgmt/recruiting. I'm not generally the tinfoil hat wearing kind of person, but just find all of this to be very interesting, if not highly coincidental. Below is a link to the tweet and attempted copy of the picture.